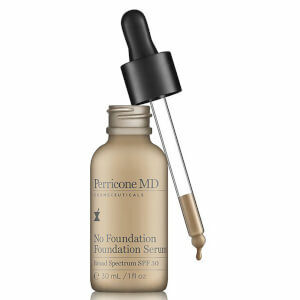 No Foundation Foundation Serum instantly softens imperfections and minimizes the appearance of wrinkles and pores with neuropeptides without settling into fine lines. A luxurious fluid texture ensures a semi-matte suede finish with a breathable second skin effect. It comes in one universal shade or you can customize to match your skin tone with No Bronzer Bronzer. Corrects skin undertones, minimizes the appearance of fine line and pores. Apply evenly all over the face using gentle, circular motions. Use on top of treatment(s) and/or moisturizer. Reapply if necessary. This is very good product, but color is too yellow and tan. Perricone is a wonderful product. Their line of cleansers and facial products are amazing. Though i’ve yet to try their make up line. I am sure that it’s just as great.